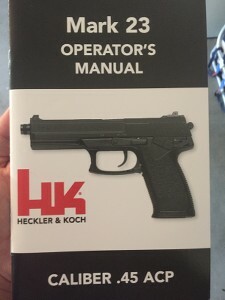 Wondering how many variants of the Mark 23 manual are out there. I’ve seen at least 3 different manuals digging through posts on here. This is the one that came with my 2010 Mark. Last edited by josh_ua92; 03-27-2019 at 09:19 PM. For those interested, here is a photo of two of the manuals that @AGG mentioned. I hope @Kelly is okay with me borrowing their photograph from a previous post (original post linked below photos). 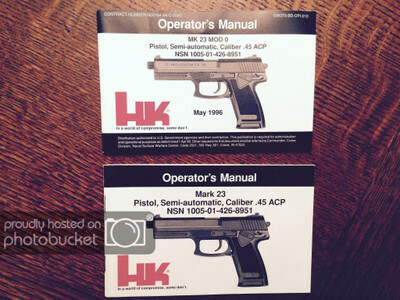 The top photo is of the “a) MK23 MOD 0” manual. Bottom is an earlier “b) MARK 23” manual (appears to be the 1996-2002 variant). I'm very fortunate to have all those manuals but the hardest to acquire would be top photo (MK23 USSOCOM). I believe I have 2 or maybe even 3 brand new in their ziplock packet. @audiction that is very impressive!! THREE nonetheless. Do you have the Euro manual aswell?? Last edited by josh_ua92; 03-28-2019 at 11:58 PM. yes i only have 1 and it came with my unfired euro mark 23.